Inelta’s IKAL series miniature LVDTs are merely 8 mm wide and weigh only 30 g.
In very close quarters, Inelta Sensorsysteme’s extremely slender LVDT displacement sensors (linear variable differential transformers) of the IKAL series ensure highly accurate position detection and path length measurements. In very close quarters, Inelta Sensorsysteme’s extremely slender LVDT displacement sensors (linear variable differential transformers) of the IKAL series ensure highly accurate position detection and path length measurements. With a housing diameter of only 8 mm and a housing length of no more than 96 mm even for the longest version, these sensors fit into the most tightly confined installation spaces. They are available in four different versions for measuring distances up to 2 mm, 5 mm, 10 mm and 20 mm. The sensors achieve a standard linearity tolerance of <0.5% and are optionally available with a linearity tolerance of <0.25% for even more demanding applications. Thanks to their non-contact inductive measuring principle, these LVDT sensors are wear-free. 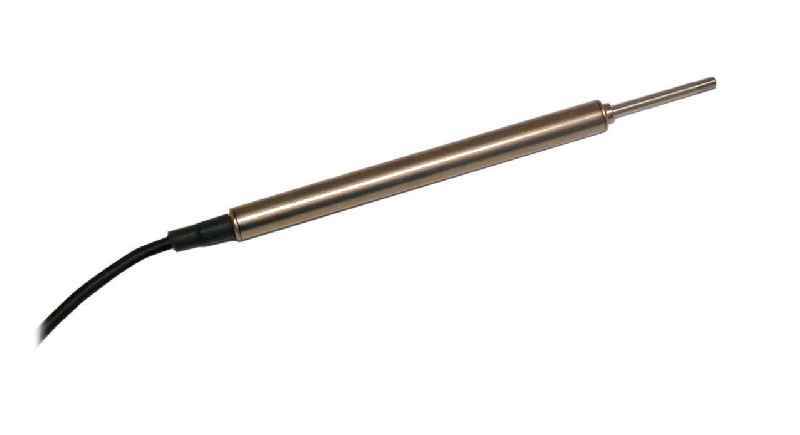 The miniature displacement sensors are made from nickel-plated steel and provide IP65 ingress protection. They are long-lived and extremely rugged – they are not only designed for environmental temperatures from -25 °C to +85 °C, but also withstand shock impact and vibrations of 200 g over 2 ms or 10 g over sine wave frequencies from 2 Hz to 2000 kHz, making them exceptionally resistant even to severe mechanical stress. IKAL series sensors are therefore suitable for very diverse applications, ranging from medical technology to machine building, to the agricultural sector, ships, test facilities, or special purpose machine engineering. Standard supply for all models includes a one meter cable. Other lengths are available on request. To complement IKAL series displacement sensors, Inelta also offers compatible external IMA2 LVDT sensor signal amplifiers for 0 .. 5 V, 0..10 V, ±5 V, ±10 V, or 0/4..20 mA output. The IVM2 LVDT print module with a 0 .. 10V signal output is also available to facilitate an integration into custom electronics. In addition, Inelta provides customer-specific sensor types on request for options such as individual calibrations, special cable lengths, or an extended temperature range. Inelta’s ILAT series features tiny LVDT sensors for precise position and path detection with single-digit millimeter accuracy. Available as ILAT2, ILAT4, or ILAT10 models, they are suitable for highly precise ±1 mm, ±2 mm or ±5 mm distance measurements. Inelta’s ILAT series features tiny LVDT sensors for precise position and path detection with single-digit millimeter accuracy. Available as ILAT2, ILAT4, or ILAT10 models, they are suitable for highly precise ±1 mm, ±2 mm or ±5 mm distance measurements. The sensors fit into very constricted installation spaces thanks to their extremely small dimensions. The housing is no more than 79 mm long, with a diameter of merely 8 mm, and a weight of just 30 g including the cable. Based on the inductive LVDT principle, ILAT series sensor operation is entirely wear-free, and they achieve a linearity tolerance of <0.25%. In LVDTs, or linear variable differential transformers, a coil system with a primary and two secondary windings inside the sensors transforms the linear movement of the measuring probe into an electrical signal. An even lower linearity tolerance of <0,1% is optionally available. Despite the small dimensions, ILAT sensors feature an exceptionally rugged design with a stainless steel housing that provides IP65 or optionally IP67 ingress protection. The nominal temperature range is 0 to 70 °C. Manufactured with great care and attention to detail, the linear guide is equipped with a rotation lock for the slide and lasts for more than 10 million cycles. The sensors are therefore suitable for a versatile range of applications, from medical technology to machine building, to the agricultural sector, ships, test facilities, or special purpose machine engineering. To complement ILAT series displacement sensors, Inelta also offers external IMA2 LVDT sensor signal amplifiers for 0..5 V, 0..10 V, ±5 V, ±10 V, or 0/4..20 mA output. The IVM LVDT print module with a 0..10V signal output is also available to facilitate an integration into custom electronics. 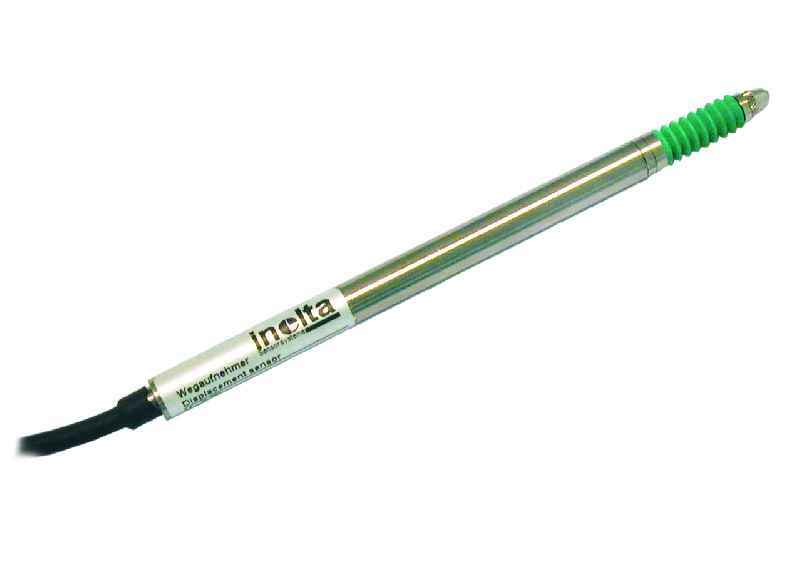 Inelta also provides customer-specific sensor types with additional options, such as individual calibrations, cable lengths, and extended temperature ranges on request. Almost as slim as a match: IZAL series displacement sensors from Inelta are only 4 mm wide and 55 mm tall. No more than 4 mm wide, the slim LVDTs (linear variable differential transformers) in Inelta’s IZAL series of reliable and highly precise miniature displacement sensors are especially suitable for demanding environments. No more than 4 mm wide, the slim LVDTs (linear variable differential transformers) in Inelta’s IZAL series of reliable and highly precise miniature displacement sensors are especially suitable for demanding environments. The sensors with housings made from nickel-plated steel ensure IP65 ingress protection and are designed for environmental temperatures from -25 °C to +85 °C, or an even wider range upon request. They are actuated by an unguided core with a diameter of 2 mm. These LVDTs are available in versions for 2 mm, 5 mm and 10 mm measuring distances. Since their function is based on contactless inductive measurements, they are wear-free, achieve < ±0.5% linearity tolerance, and can optionally be supplied with a linearity tolerance of <±0.25%. IZAL series sensors are also very robust: they are highly impact-resistant (200 g over 2 ms) and vibration-proof (10 g at sinusoidal frequencies ranging from 2 Hz to 2000 kHz). Encased in 55 mm housings, these sensors are only slightly taller than a match and thus easily fit even into very tight installation spaces. In order to ensure exceptionally high measurement quality despite the extremely compact dimensions of these miniature differential transformer measuring system, the tiny coils in these devices are wound by hand under microscopes in Inelta's production facility. The sensors come with a 1 m connection cable or other cable lengths on request. The manufacturer also optionally offers cables in different colors and supplies custom-calibrated sensors on request. For the standard signal conversion of the measured values, Inelta provides suitable external signal amplifiers for output signals in the 0..5 V, 0..10 V, ±5 V, ±10 V, and 0/4..20 mA ranges, and a print module for 0..10 V signal output. 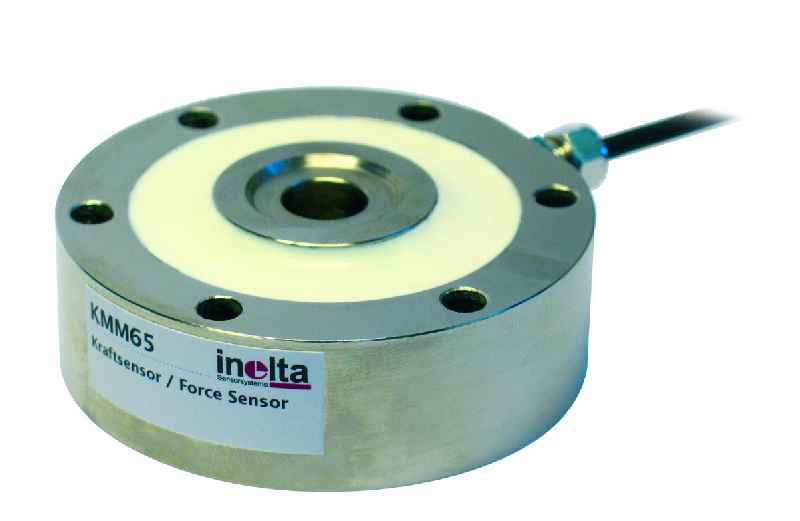 The KMM65 series of force sensors from Inelta Sensorsysteme comprises nine different models for measuring tensile and compressive forces between 1kN and 500 kN. Depending on the measuring range, sensor diameters vary between 50 mm and 260 mm, with installation heights between 18 mm and 80 mm. The KMM65 series of force sensors from Inelta Sensorsysteme comprises nine different models for measuring tensile and compressive forces between 1kN and 500 kN. Depending on the measuring range, sensor diameters vary between 50 mm and 260 mm, with installation heights between 18 mm and 80 mm. KMM65 sensors use the DMS load cell measurement principle and achieve <0,1% repeatability. They are available for a nominal temperature range between -10 °C and +70 °C, or optionally for an extended temperature range from -40 to +120 °C. The housing made of nickel-plated steel features IP54 ingress protection. 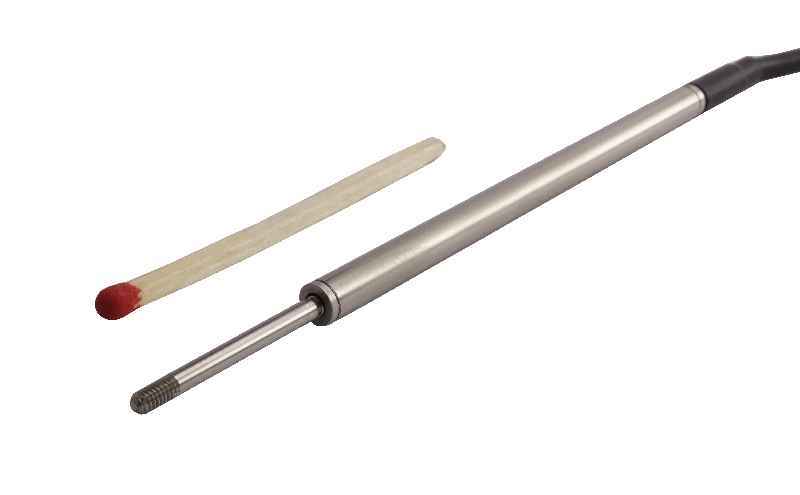 Due to their durability and small dimensions, KMM65 series force sensors are suitable for a wide variety of applications, ranging from weighing technology to testing facilities, to industrial presses, machine building, and even sports equipment. Depending on the model, the sensor housings feature 6 or 8 metric screw holes in M4 to M20 size for mounting. Each sensor is supplied with a two-meter cable as standard. Other cable lengths as well as individual calibrations are available on request. As a complement to these force sensors, Inelta provides IMA2 DMS external sensor signal amplifiers for 0..5 V, 0..10 V, ±5 V, ±10 V, 0/4..20 mA signal output, as well as the IVM2 DMS print module for 0..10V signals that facilitates integration into custom electronics.